It'll set you back at least $2,490, though. The idea of the luxury smartwatch is not new -- TAG Heuer, Montblanc and Movado are just a few premium brands to have incorporated Android Wear into their lineup -- but it's still something of a novelty. 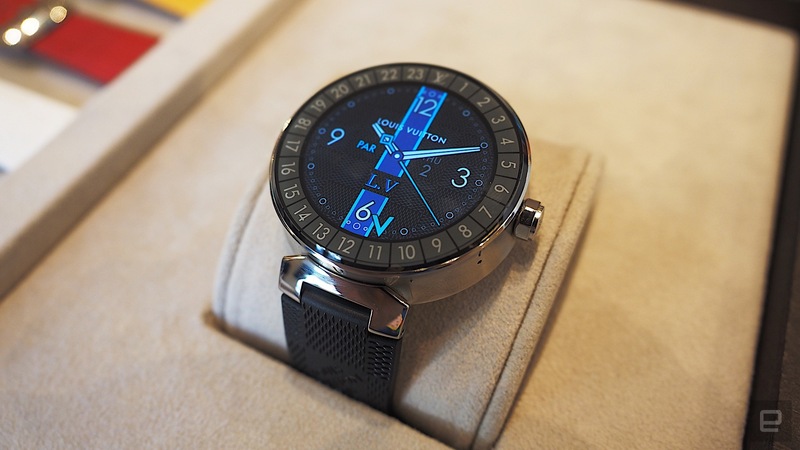 That hasn't stopped Louis Vuitton to plunge headlong into wearables space, however, as it debuted its first-ever connected watch yesterday. It's called the Tambour Horizon and its price starts at a jaw-dropping $2,490. I managed to get my plebeian hands all over it just a day after the announcement, and while I would never actually buy one, I'll admit that it's quite a stunning piece of wristwear. Let's start with the design, because that would be the first and foremost reason you would even want this. It is, in short, gorgeous. The colors on the 1.2-inch AMOLED pop off the screen and the stainless steel chassis is perhaps the most elegant I've seen on a smartwatch. I especially like that it comes in brushed steel, stainless steel and a black steel. And, of course, you can choose from over 60 different styles of premium Louis Vuitton straps. The 42mm case struck me as neither too large nor too small, and though it might still prove a little large for those with slim wrists, I can see it appealing to ladies who prefer a bigger watch. Plus, a smaller case would necessitate a smaller screen size, and I think the 1.2-inch screen is perfect here. Still, like all Android Wear smartwatches, it's pretty chunky -- about 12.5mm thick -- and will weigh your wrist down somewhat. What salvages it is a lovely convex curve on the circumference of the chassis, which minimizes its otherwise bulky look. Though the specs were already known, they're worth revisiting here. 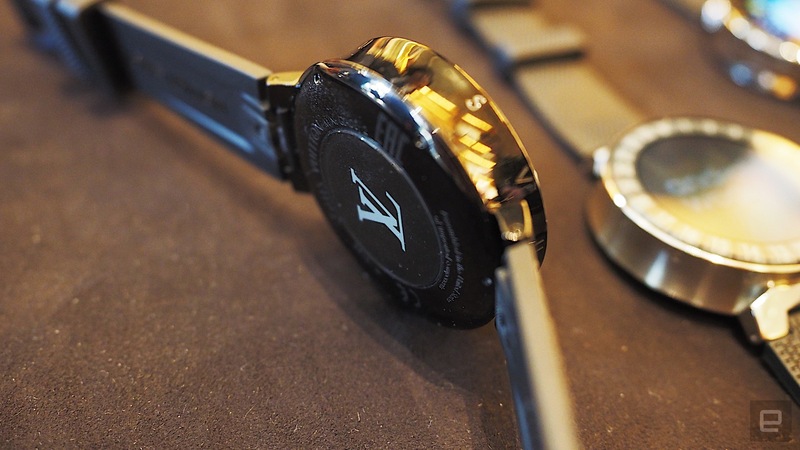 The watch has a 300mAh battery, which Louis Vuitton says can last about a day on a charge. There's also 512MB of RAM and 4GB of storage under the hood. There's no optical heart rate monitor, which I'm guessing would add additional cost to an already expensive watch (but then again, shouldn't you get the kitchen sink for that kind of money?). Another interesting point is that the watch face never entirely goes dark; it might dim over the course of the day, but a quick jolt would kick the screen back to life in a jiffy. And, of course, it has Android Wear 2.0, which comes with a boatload of features like customizable watchfaces and a standalone app store. The Tambour Horizon ships not only with a slew of different Louis Vuitton watchfaces -- I really like the one in the lead image here -- but it also comes with two proprietary apps exclusive to the brand. One is called City Guides, a contextual app that knows which city you're in, so it can help guide you to great restaurants and sights. Another is a travel app that will let you know valuable trip information like flight departure times and which gate you should go to. Clearly, Louis Vuitton is aiming the Tambour Horizon at a jetsetter sort of clientele here. As gorgeous as it is, I'm hard-pressed to recommend it. As mentioned, the watch starts at $2,490, and the prettiest of the lot -- the black one -- goes for $2,900. Most people who buy the analog versions of these luxury watches want them to last for years, possibly decades. A smartwatch, as advanced as it is right now, would likely be out of date in just two or three years. At least the TAG Heuer Connected Modular 45 lets you swap in your smartwatch with a mechanical timepiece; the Louis Vuitton Tambour Horizon has no such option. Of course, if you can afford to spring $2,000 every couple years for a watch, who am I to stop you. But for the rest of us, that's far too steep.